Mexico’s largest company is broke. 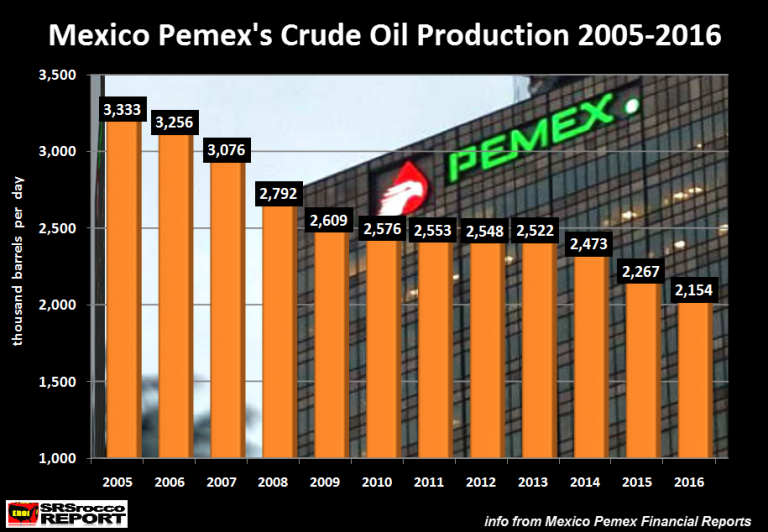 The country’s state oil company, Pemex, which is one of the federal government’s main sources of revenue, is losing money and is one of the world’s most indebted oil firms. The company’s production has dropped for 11 straight years now, while gross income plummeted more than 80 percent last year. The Mexican Peso-U.S. Dollar is shown in orange, while the Brent Crude oil price is in black. As we can see the largest drop in the Mexican Peso’s value took place when the Brent Crude oil price declined significantly. Since the Brent Crude price fell below $100 in August 2014, the value of the Mexican Peso’s has fallen 32% versus the U.S. Dollar.